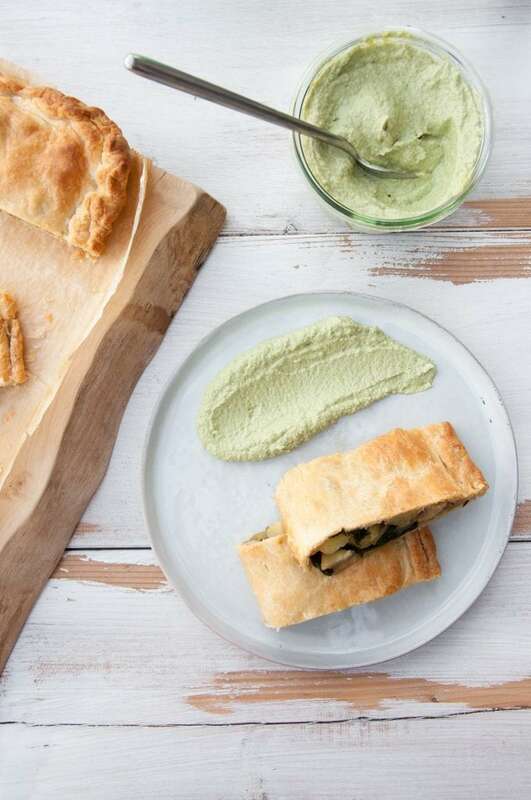 Recipe for a vegan savory Potato & Spinach Strudel. It’s the perfect easy lunch/dinner recipe. Delicious with a cilantro sunflower seed dip! Strudel (either savory or sweet like an Apple Strudel) is something we eat quite a lot here in Austria, so I thought it’s time to put a savory strudel on the blog as well. This strudel is filled with potatoes and spinach – one of my favorite combos of all time, but of course you can use other fillings as well! I’ve used store-bought vegan puff pastry for this recipe. Puff pastry is one of the few things that I don’t want to make from scratch because I tried and I failed :D. Remember the Cilantro Lemon Sunflower Seed Dip I’ve posted? 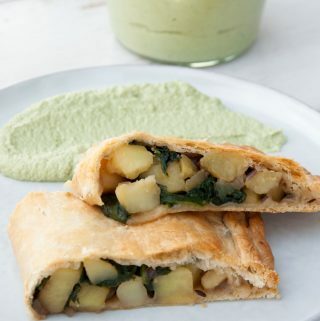 It’s the perfect sauce to serve with this vegan Potato & Spinach Strudel. 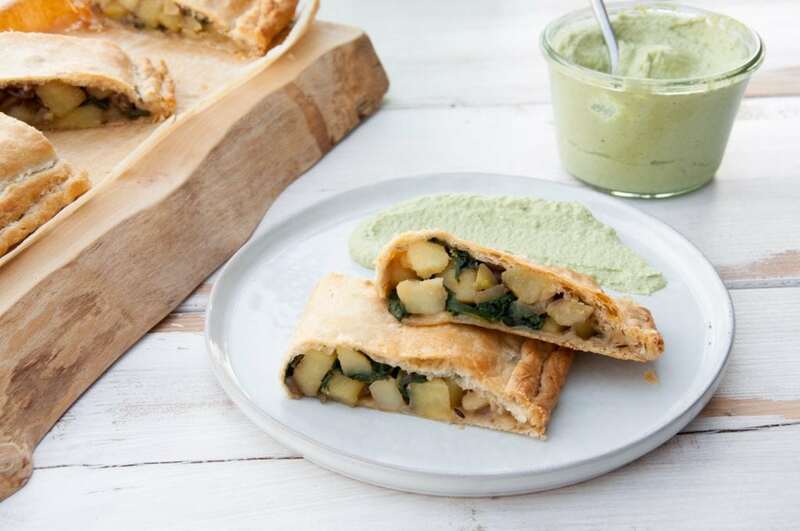 As you can see, this Potato & Spinach Strudel is so easy to make! Prepare the filling, place it onto the puff pastry, fold it, close the edges and bake. Yumm! It’s perfect for quick lunches or dinners! 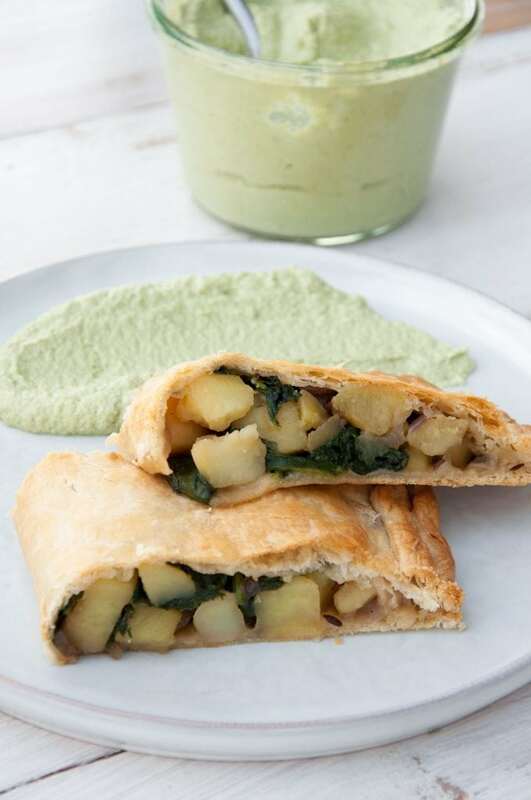 Recipe for a vegan savory strudel filled with potatoes and spinach. It's the perfect easy lunch or dinner. A cilantro lemon dip is the perfect sauce/dip to go with it! Boil the potatoes in water until soft. Meanwhile heat a pan with olive oil and add the cumin and chopped onions, cook until the onion is translucent. 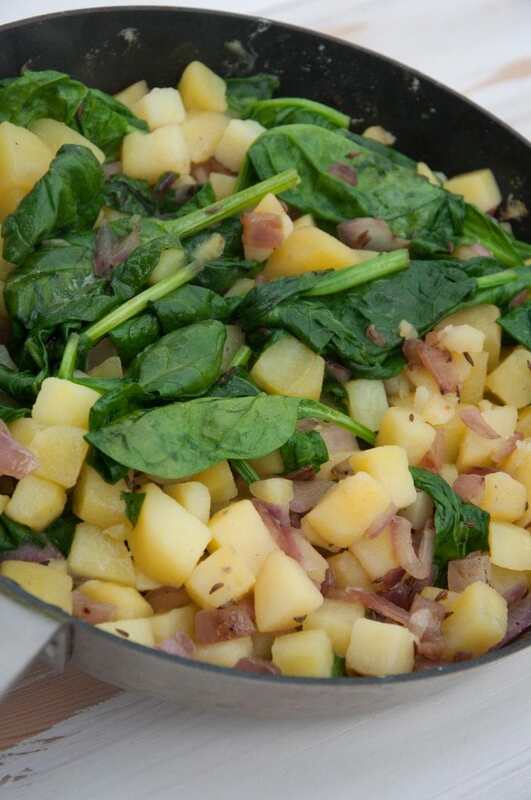 Add the spinach to the pan, only until wilted (you don't need any heat for this). Once the potatoes are soft, drain them. And add them to the pan. Season everything with salt, mix together, and let the filling cool off. Pre-heat the oven to 400°F / 200°C. Place the potato & spinach filling on the puff pastry, fold it and close the edges. Bake it in the oven for about 25 minutes, until the puff pastry got a nice, golden color. Serve with a homemade Cilantro Lemon Sunflower Seed Dip, for example, and enjoy. Oooo it looks so good! Always such beautiful recipes that I wish I could have!! Need gf/vegan puff pastry STAT! This looks seriously delicious! Definitely a comfort food type of recipe! Tried this yesterday and it came out delcious! I added a bit of Garam Masala and a bit more Curry Powder, but really thats just bc I love curry powder! 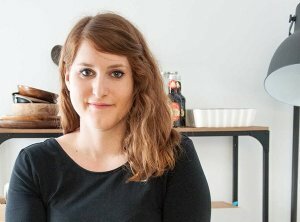 In terms of vegan puff pastry dough, I am from Germany and I bought the Rewe housebrand one. We (I’m from Austria) are really lucky to have vegan puff pastry in pretty much every store, right? :) People from the US have to do much more digging and searching. Garam Masala sounds like an excellent addition and I’m a huge curry powder fun myself so I completely understand you. Glad you liked it, Nik! 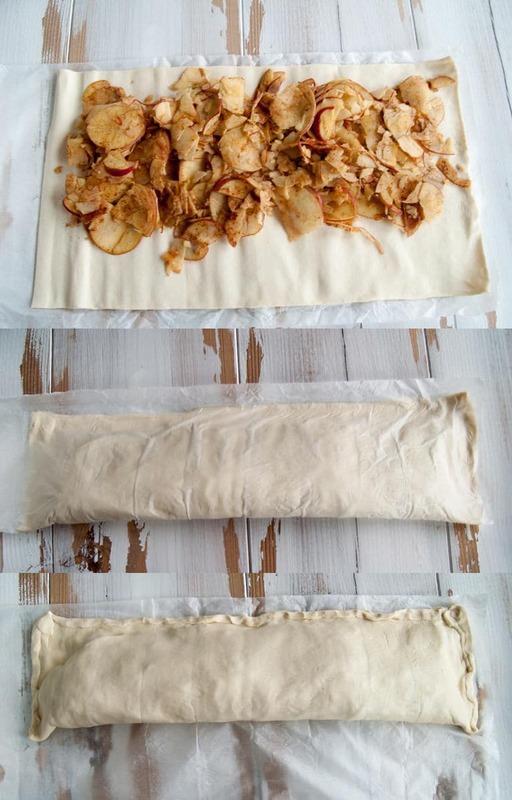 How many sheets of puff pastry did you use? Hi Michelle, I used one sheet of puff pastry. The ones I get here are usually 40x24cm = about 15×9 inches large, so if you’re using a smaller one, you might want to take two or more and pinch them together or just make a smaller portion of the strudel. But good tip with the phyllo!